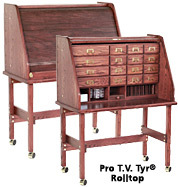 New rolltop model is available in all three sizes (TV TYR, PRO, and Deluxe). Cabinet's are identical to the originals. Tables are slightly larger to accommodate rolltop sides and cover. Cover is lockable. Note: If you want the recommended surface protector, you should include it in your original order. Because of the cover locks; it can not be added later. For rolltop pricing, see below. The work surface is 18" x 36" x 1-1/4" thick / 27" high. Note: See Accessories for complete descriptions. Casters, label holders-with-pull and hardware for braces are brass. Drop leafs and/or drawer under table available. See "Accessories"
Although TV TYR is ideal for the beginning Fly Tyer, it holds sufficient materials for even experienced tyers. 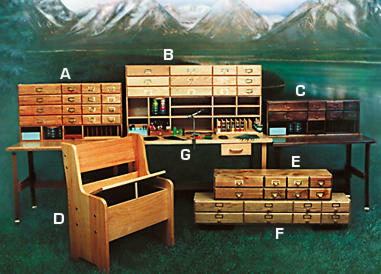 For additional drawer space, the Add-on Cabinet is always available. The work surface is 18" x 36" x 1-1/4" thick and is 27" high. Enough storage for the experienced tyer, but retains the mobility of the TV Tyr. Accessories and work surface are the same as the TV Tyr. Designed for the tyer who has a lot of materials. Order the FLY TYER'S BENCH or use your own table. DELUXE ADD_ON CABINET available at any time. Top is 24" x 48" x l-l/4' thick. Legs have adjustable feet for leveling. Easy assembly. Instructions and supplies to assemble included. Drop leafs and drawers available (See Accessories). 24" Wide with 10" x 13" x 22"
Seat 19" High with excellent lower back support. Lean back/not forward when tying. Aromatic Red Cedar bottom liner. OUR GUARANTEE: If you are not satisfied with any purchase, you may return it within 30 days for a full refund of your purchase price. Send it back with your name and address, in our original package prepaid and insured. Every TV Tyr is numbered, dated and signed. Note: Price subject to change due to lumber, hardware, and freight costs.